mediSOS . :: Are Robots Becoming The New Doctors, This Doctor's Day Lets Review Advancement In Medical Technology ::. All too often we hear about the benefits of mobile or 3D printing, but how often do you hear about medical nanobots or nanomites? The average life expectancy is increasing. In 1960, average life expectancy was 69.8 years, thirty years later that rose to 75.2 in 1990 and today it’s around 78.8 years according to the Centers for Disease Controls and Prevention (CDC). New approaches to medicine and treatment are no longer optional, they’re essential. Robotic health offers some answers. From telemedicine (clinical health care at a distance) to bioelectronics (stimulate and monitor your nervous system), the health ecosystem is evolving quickly. The greatest medical achievement in the last 100 years is the advancement of personal genome sequencing mapped to repositories of population diseases: introducing the migration from population health to personal genome diagnosis. The N-of-1: one patient one trial. Combine this with nanobots, in a world where, nanoids, nanites, nanomachines, and nanomites all reference nanomachines and nanomotors at which time biological machines could be used to identify and destroy cancer cells. In this future world disease is not a setback but merely a distraction like a low oil light. The car isn’t sick. It just needs a repair or tune-up and quickly it’s back on the road. 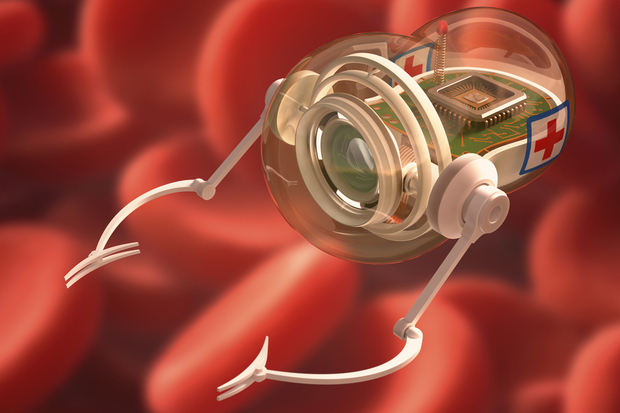 Medical nanotechnology is expected to employ nanorobots that will be injected into the patient to perform work at a cellular level. Ingestibles and internables bring forward the introduction of broadband-enabled digital tools that are eaten and "smart" pills that use wireless technology to help monitor internal reactions to medications. Medical nanotechnology is just the edge of the cliff. Let’s jump off. Dermables, digital stickers for the skin open a vast range of possibilities. Netatmo’s JUNE bracelet adds some class to UV monitoring and UVSunSense make monitoring sun exposure fun. Why don’t we hear about these advancements in robotics every day? How come the population isn’t demanding small pilots that will undoubtedly extend life? I honestly don’t know. Stardust predictions get everyone talking – how to do we separate the mythical from the magical? We can start by understanding the stakeholders in robotic health. Hint: they are not only the mad scientists in labs looking for new breakthroughs. They are your wife, husband, daughter, son, grandmother, or grandfather – these are the stakeholders, and they all have similar goals. Their goal is simple, stay healthy. In a draft journal article by Simshaw, Terry, Hauser, and Cummings titled, Regulating Healthcare Robots in the Hospital and the Home, the report suggests that family members and caregivers, healthcare providers, technology providers, aging or physically challenged individuals have similar goals. Their collective goal is to provide independence, preserve dignity, empower those with special needs and provide peace of mind to all of the stakeholders. These stakeholder's goals are aligned, despite how rare this might be. Direct patient care robots: surgical robots (used for performing clinical procedures), exoskeletons (for bionic extensions of self like the Ekso suit), and prosthetics (replacing lost limbs). Over 500 people a day loses a limb in America with 2 million Americans living with limb loss according to the CDC. Indirect patient care robots: pharmacy robots (streamlining automation, autonomous robots for inventory control reducing labor costs), delivery robots (providing medical goods throughout a hospital autonomously), and disinfection robots (interacting with people with known infectious diseases such as healthcare-associated infections or HAIs). In January 2016, the Population Reference Bureau report, "Aging in the United States,” showed that Americans 65-and-older will more than double moving from 46 million today to 98 million by 2060. The growth of the total population 65-and-older population is projected to grow from 15 percent to nearly 24 percent. Who will take care of the influx of aging individuals, when timely healthcare today is already questionable? Medical robots will change healthcare. They have to.